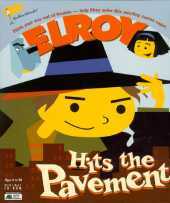 Join Elroy and his pal Blue in this relentlessly inventive cartoon adventure. You have to use your head as you play - like learning about lasers, batteries, secret codes and special fuels to help Elroy break into the booby-trapped, bad guys' hideout. You decide where the story goes; play it again and again as you uncover the different ways to wrap up this fully animated adventure game. Roll up your sleeves and prepare to get down to business as Elroy, and his pal, Sydney Delgado, prepare for their big science project. It's a race against the clock, because if Elroy and Sydney don't finish their project, they're headed for summer school. And, that's not cool. But first, we had to find the missing mutt, Blue. Steer Elroy away from lots of bad guys (Gordon Smugs is up to dastardly stuff, again) and get lost in a mysterious building as Elroy searches for Blue. A series of mazes, and doors which look identical, make this activity the most challenging of all.